Summertime! Does your garden have a million of THESE? How about stuffing them for a tasty treat? 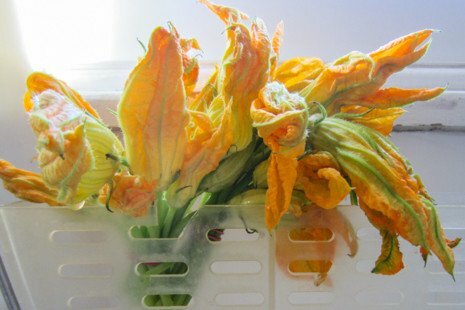 Don’t fret if you have no blossoms to stuff – often you can find them at your local farmer’s market. Ask your squash farmer if you don’t see them at the stand — sometimes they’re tucked away for loyal customers like you. Or order ahead! When selecting blossoms, look for sturdy ones with lots of color. Clean the blossoms in a bowl of icy-cood water, gently swirling the blossoms to release any dirt. This will refresh them if they are limp. Dry with kitchen towels and set aside until you’re ready to fill. 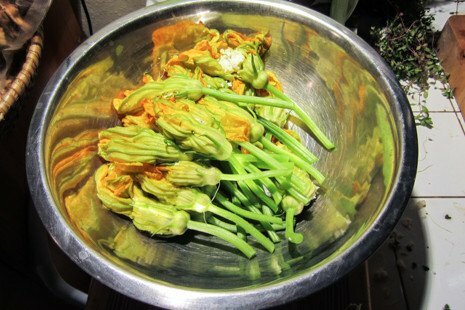 Once the blossoms are fried and stuffed, they are ready to get crisped in the pan! Heat some oil in a pan – a little grape seed oil will do. Get it nice & hot, lay each stuffed blossom in gently and brown, one side at a time, until golden and crispy. Delightful! Remove stamen from inside each blossom, rinse, pat dry, and set aside. Chop the herbs and combine ⅔ of them with zest and cheese. Stuff each blossom with cheese mixture, pressing the petals into the mixture to seal them. Combine rice flour, sparkling water, salt, and lemon juice to taste, adding more flour or water as needed until you have a light and nicely seasoned batter. Fold in remaining ⅓ chopped herbs. Heat oil in a shallow pot until it’s hot but not smoking. 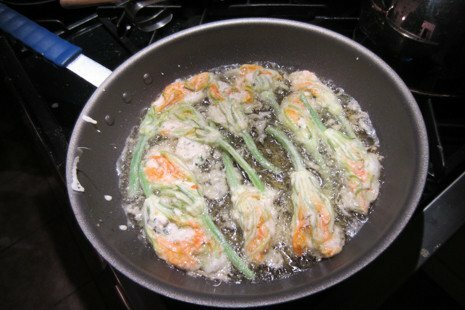 Dredge blossoms in flour mixture and gently lay in hot oil, turning after a few minutes to fry each side until golden. Remove to a towel-lined plate then serve immediately with aioli or on a bed of a simple tomato sauce and sing to summer!